Many thanks to Tibetan Mastiff owner, Sean, from Longwood CO who took out some time to talk to us today about his dog, Hōyō. Can you tell me a little bit about your dog? Hōyō is a one-year-old, neutered, male Tibetan Mastiff. His name is “cuddles” in Japanese, as it could possibly be what he does best. Hōyō is a 162 pound, 30-inch dog, who loves to run and play nearly as much as he loves to nap. I bought him from a family in the Czech Republic, and once he arrived, he was already a solid 70 pounds at 7 months old. As loud and large a baby bear, Hōyō has been an excellent addition to my family. Hōyō was relatively easy to housebreak, but commanding his attention was surprisingly difficult. Mastiffs need a strong, confident owner for them to be trained properly, or else they may become stubborn and reluctant to pay any attention to your commands. Extremely intelligent dogs, once their respect is earned they will be impressively loyal companions. By taking Hōyō to a couple obedience classes, I can say I’ve just barely managed to hash out a deal with this dog for its moderate compliance for a regular bone salary in return. How much exercise does a Tibetan Mastiff Need? In case it was not clear enough the first time, this is a 162 pound beast. That’s a big dog, and with big dogs comes significant responsibility and exercise. 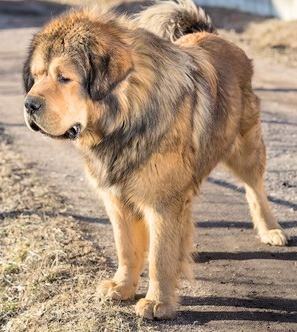 Tibetan Mastiffs need daily exercise to keep them healthy, so I take Hōyō on a walk every day. These Mastiffs also need a decent amount of living space for them to be in the best mood possible, so they are not very ideal dogs for a confining environment. It is important to take into consideration the exercise needs of a Mastiff. Without regular exercise they may become lazy and overweight. Despite their immense amount of hair, Tibetans do not have an obnoxious smell. They will, of course, smell when wet, but as do all dogs. The only times Hōyō has every actually reeked was when things got matted in his coat. For the most part, I only have to give him a bath once a month, or as needed really. The lack of smell is prominent, despite not shedding very heavily. Hōyō’s sheds fairly little despite his thick coat. This is especially nice, as there is not much mess to clean up after them and they make great hypoallergenic dogs. Mastiffs are known to shed seasonally, especially in Spring when they shed away their thicker winter coat. If you want a hypoallergenic dog that does not shed especially hard, Tibetan Mastiff’s are an excellent choice. Hōyō does not bark much, as with most dogs of the breed. When he does bark, however, you will hear it. When they bark, they bark loud. Exposing any dog, but especially this breed, to many different environments, creatures, and people can help quell their urge to bark, as they will have fewer surprises. I let Hōyō sleep in a large dog bed indoors so as not to scare my neighbors, as these hounds are known to bark outside at night. He definitely appreciates the comfort, as whenever he is not running around outside in the yard, he’s probably asleep in the bed. Hōyō is well behaved around other dogs for the most part. I have 2 other dogs that he grew up with, so he is accustomed to the presence of other canines. I do try to avoid very small dogs with Hōyō, as he plays rough and may get too excited and injure them. Tibetan Mastiffs are not always quite as well behaved. Their loyalty to their owner can make them too protective, so it is best to take them to obedience classes and expose them to as many different dogs as possible. Do you have any other kinds of pets besides your dog? I own a snake, but other than that I do not have any other pets besides dogs. It is not ideal to have a small animal like a cat or rabbit in the house, as mastiffs may hurt them by accident, being so large. These beasts are also known to snap at small animals as a natural instinct, as they were bred to be sheepdogs, protecting flocks from predators. On a few occasions, Hōyō has brought in rabbits or squirrels that he had managed to catch. As you could probably guess, a dog as heavy as the Tibetan Mastiff can be dangerous to things smaller than it. This does not exclude children, as they could easily be injured by such a large dog. I do not have any children, so Hōyō has only my other dogs and me to play with. This is the recommended environment for such dogs, as any small children are at risk living with such a dog. Nope, Hōyō is a great eater. His weight and frequent exercise allow him to work up quite an appetite. He might eat anything he could get his paws on, so groceries and trash need to be out of reach. It is important to balance the amount of food a Tibetan Mastiff is fed with its regular exercise and weight. Overeating can lead to obesity, and the health concerns that come with it. I feed Hōyō Purina’s Large Breed Adult Formula Dog Food, which costs about $29. I only have to brush him about twice a week. Tibetan Mastiffs also do not get too dirty, so I only have to bathe Hōyō once a month. It is also important to clip his nails and make sure his ears are clean, as overgrown nails can cause pain to the dog, and large, down hanging ears like Hōyō’s are more prone to infection. Hōyō’s best personality quirk is his inability to realize how large he is. He almost thinks he’s a lap dog, always laying on people when they sit on my couch. The irony of his personality compared to his size and intimidation make for quite an entertaining dog. The feeling of a young bear-sized dog trying to cuddle with you is pretty funny. Do you have any further advice for people interested in this breed? Tibetan Mastiffs are calm, yet energetic and confident dogs. They can be great companions, but so long as they know they are not in charge. It is important to have an air of authority if you are planning on getting one of these dogs, or else they may walk all over you. Aside from earning the respect of the dog, its exercise needs are an important thing to consider. If you want to get a Tibetan Mastiff, you must be willing to put in the effort required to supply it with ample exercise. If you think you can handle it, I definitely recommend getting one of these dogs. We recommend researching any breed before you make a decision.